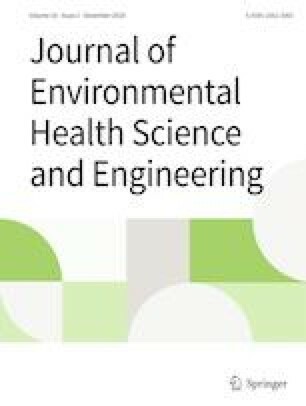 Emission characteristics of volatile organic compounds (VOC) emitted from the tank farm of petroleum refinery were evaluated in this study in order to analyze for the potential impacts on health and odor nuisance problems. Estimation procedures were carried out by using the U.S.EPA TANK 4.0.9d emission model in conjunction with direct measurements of gas phase of each stored liquid within aboveground storage tanks. Results revealed that about 61.12% of total VOC emitted from the tank farm by volume were alkanes, in which pentane were richest (27.4%), followed by cyclopentane (19.22%), propene (19.02%), and isobutene (14.22%). Mostly of pentane (about 80%) were emitted from the floating roof tanks contained crude oil corresponded to the largest annual throughput of crude oil as compared with other petroleum distillates. Emission data were further analyzed for their ambient concentration using the AERMOD dispersion model in order to determine the extent and magnitude of odor and health impacts caused by pentane. Results indicated that there was no health impact from inhalation of pentane. However, predicted data were higher than the odor threshold values of pentane which indicated the possibility of odor nuisance problem in the vicinity areas of the refinery. In order to solve this problem, modification of the type of crude oil storage tanks from external floating roof to domed external floating roof could be significant success in reduction of both emissions and ambient concentrations of VOC from petroleum refinery tank farm. • Characteristics of VOC emissions from petroleum refinery were elucidated. • Measure to prevent loss from refinery tank farm and its benefit on environment was illustrated. This study was conducted in collaboration with the Environmental Research and Training Center (ERTC) under the Department of Environmental Quality Promotion (DEQP) of Thailand. The authors would like to thank ERTC in providing measurement data from experiments for this analysis. The Ph.D. scholarship was granted by the Research and Researchers for Industries-RRI of The Thailand Research Fund. This study was partially supported for publication by the China Medical Board (CMB), Center of Excellence on Environmental Health and Toxicology (EHT), Faculty of Public Health, Mahidol University, Thailand. U.S. EPA: AERMOD: description of model formulation. https://www3.epa.gov/scram001/7thconf/aermod/aermod_mfd.pdf (2004a) Accessed 26 June 2018. U.S. EPA: User's guide for the AERMOD meteorological preprocessor (AERMET). https://www3.epa.gov/scram001/7thconf/aermod/aermetugb.pdf (2004b) Accessed 26 Jan 2019. U.S. EPA: Compilation of air pollutant emission factors AP-42. Fifth ed., vol. 1, chapter 7: Organic liquid storage tanks. https://www3.epa.gov/ttn/chief/ap42/ch07/final/c07s01.pdf (2006) Accessed 26 June 2018. U.S. EPA: AERMOD model formulation and evaluation. https://www3.epa.gov/ttn/scram/models/aermod/aermod_mfed.pdf (2018) Accessed 26 June 2018.